Since my last post, I have been mucking around with a number of different projects. I completed fitting the checkrails to the remaining eight turnouts in the UP yard, as well as completing installation of point blades, Cobalt motors and checkrails to the first eight turnouts in the DOWN yard. I have also been mocking up some of the future upper deck supports to get some ideas on how it will all work. More on this in a future post. For me to continue on the benchwork and spline construction from the teardrop at the helix end, I needed to finish off some work in the toilet area so I wouldn’t have to work in and around benchwork. I needed to finish off installing the cavity sliding door, install some new lining on two walls and the ceiling and paint the whole thing, including the two brick walls. 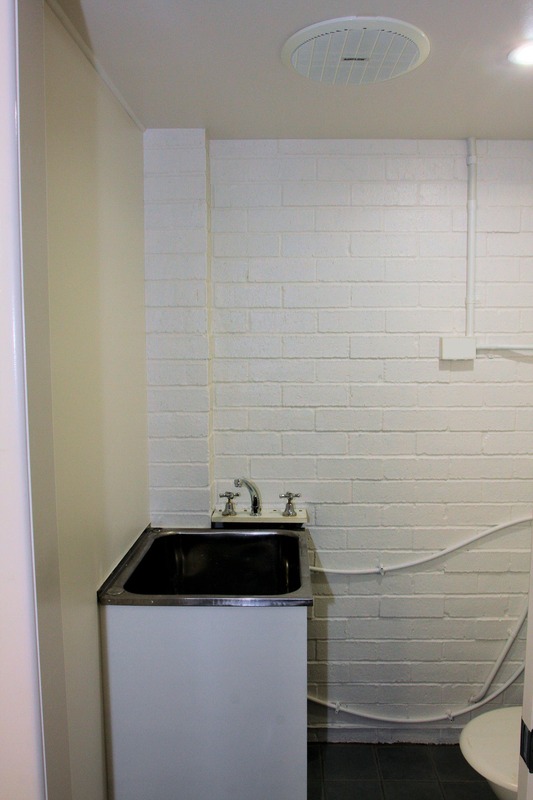 This room will also become the spray painting area, so a small spray booth will be mounted on the wall above the tub. So, the next job will be to continue on with the main benchwork from the helix area around in front of the toilet and back to the DOWN storage yard. 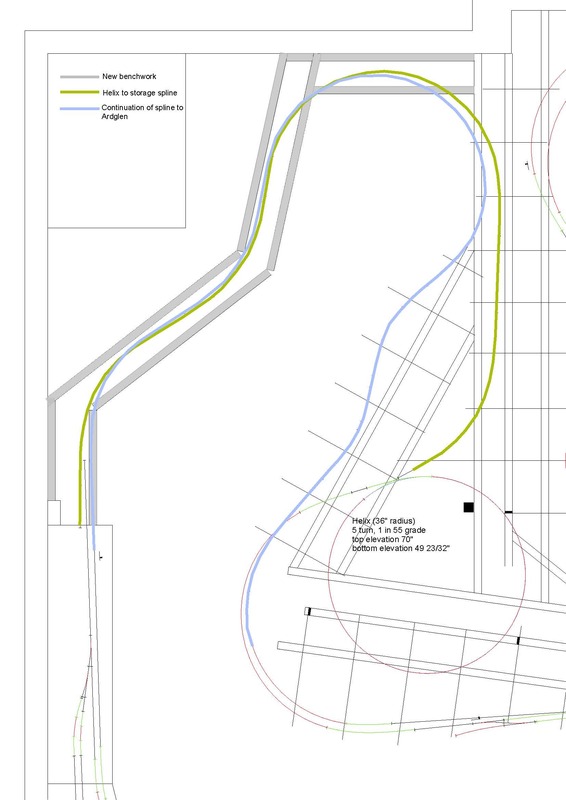 I will then install the spline and PECO flextrack from the base of the helix to the DOWN yard. As this will be hidden, once it’s in, I can then continue on with the mainline spline above, all the way to the start of Ardglen. The above layout snapshot shows the next planned stages of construction. Access to the toilet/spray booth will be via duck-under, but this was inevitable. Since it won’t be utilised all that frequently, I don’t see it as an issue. 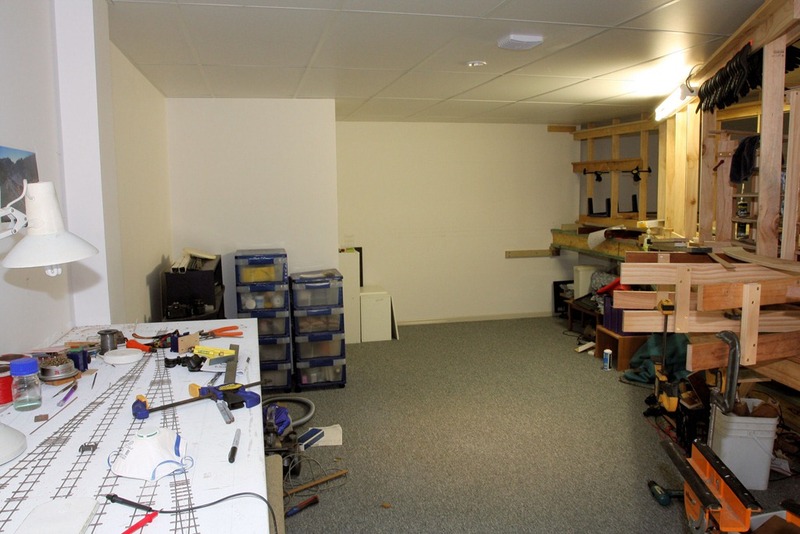 Below is a view of the area prior to erection of the new benchwork. The main supports will be I-beams fabricated from 5×1 and 3×1 DAR pine. The resultant beam will be 6.5 x 2.75 inches. Supports along the walls will be L-girders made from 3×1 and 2×1. Joists will be attached to the top of the beams as previously described. The whole structure will be supported on legs similar to what I did here. To finish off this post, here are a couple of pictures showing the installation of electrical gaps in the storage yard trackwork. These are required to isolate each vee crossing, and to create detection sections in the storage roads. 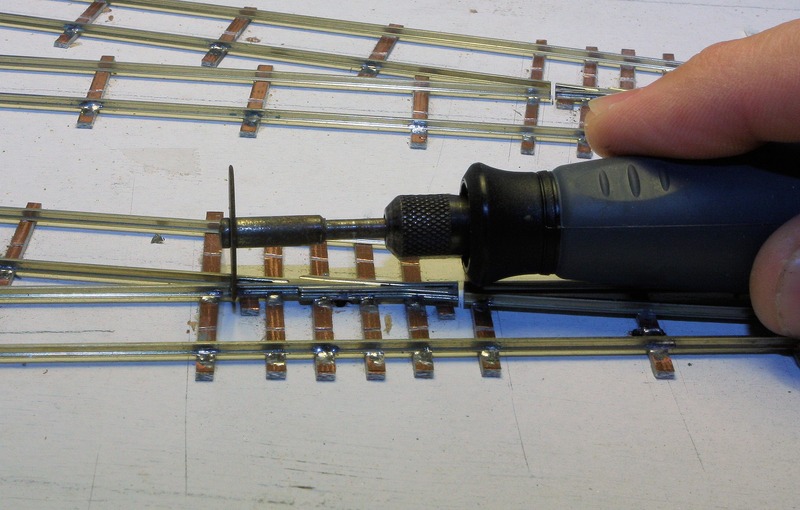 I used my Dremel tool with a thin cut-off disc and carefully cut both rails either side of the vee crossing. I had to be careful not to create too much heat that would de-solder the crossing. Once the gaps were cut, I then glued small pieces of styrene in the gap. Plenty of glue was used to secure the styrene in place. Once the glue was dry, using a new, sharp scalpel blade, the styrene was trimmed back to the rail profile. My test bogie was then run over each gap to check for smooth running. 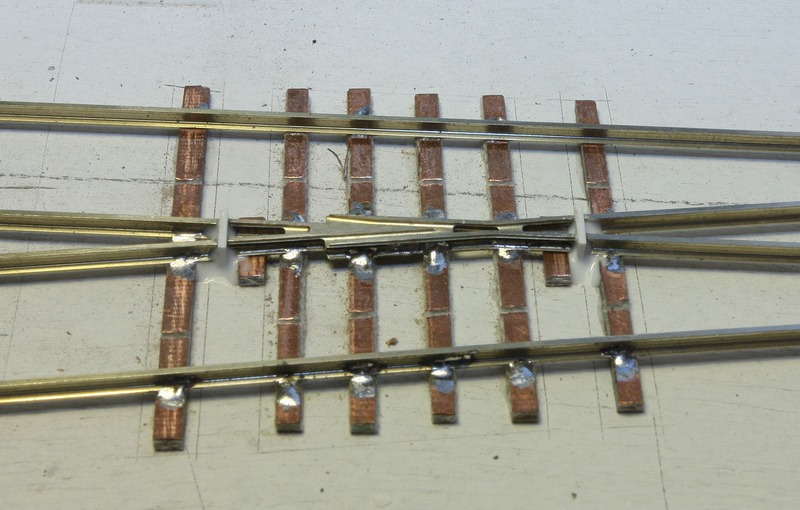 Posted on Nov 10, 2012, in Benchwork, Trackwork and tagged detection section, electrical gaps, vee crossing. Bookmark the permalink. Leave a comment.